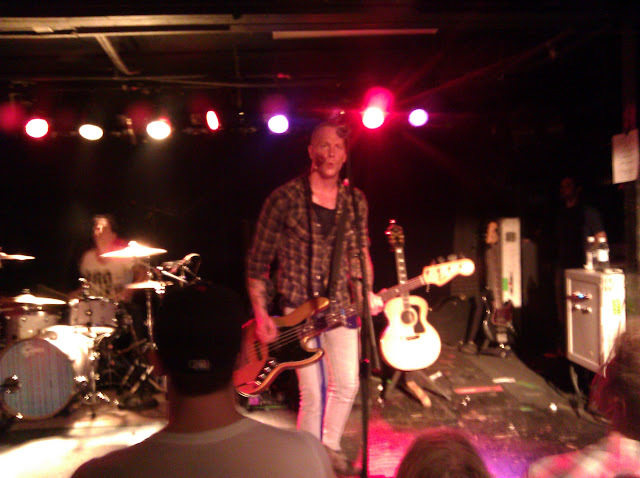 One of my favorite bands, EVE 6, recently got back together after a multi-year hiatus and put out a new album. “Speak in Code” came out a few weeks ago. I caught the band on their tour through Seattle just before the CD release, so ended up having to order mine from the Internet instead. I bought the vinyl of the album because it seems like a more interesting collectible than a CD, and while waiting for it to arrive downloaded the MP3s of the album from a non-BitTorrent download site. Just yesterday, my copy of the album arrived and inside was an unexpected code for a Dropcards.com Free Digital Download of the album! I went to check it out and download the files and got a great surprise – the free digital downloads were uncompressed WAV files. That’s about as close to the master as you can get without knowing the sound engineer who mixed it. I wanted to see the difference between the purchased uncompressed files, and the less-than-legitimate free alternative so I generated two spectrum analysis plots (FFT) and placed them on a common axis. I used the second track on the album, “Victoria” which rated decently on the top Alternative charts. On the left of the frequency plot, the “Inner Sanctum” release MP3s – the only MP3 downloads of this album I was able to find. On the right, the free digital download from Dropcards.com. As you can see there are some differences – both large and small. Click the chart for the full sized version. If you’re not familiar with an audio spectrograph, the vertical axis of the chart plots frequency with bass notes towards the bottom and treble towards the top. The horizontal axis represents the amplitude, or volume, of that frequency in the song. The further away from the center you go the louder the sound. The MP3 track starts dropping off more sharply than the uncompressed track at around 12 kHz and completely starting at 19 kHz while the uncompressed track carries more detail in those higher frequencies and extends all the way up to 22 kHz. You’ll have to listen for yourself to hear the difference, though, so go and buy their album! I might post a more detailed comparison later, with some more analysis points, if I can come up with an iTunes version of this track for comparison…if you have one and don’t mind sharing it for this experiment, get in touch! This entry was posted in Commentary, Music, Software, Technology and tagged album, analysis, audio, audio quality, bittorrent, buy, CD, collectible, download, dropcards.com, eve 6, fearless records, fft, Inner Sanctum, lossless, mp3, PCM, quality, record, show, speak in code, spectrogram, uncompressed, victoria, vinyl. Bookmark the permalink.